I had my first taste of the mountain fog this morning. I ran an early morning errand for my current host and found myself driving cautiously through the curvy, shadowy streets. Slowly I am finding my way in, around and near Asheville, still blindly following the persistent and mostly reliable voice of my GPS navigator. It’s hard to believe that I have been in Asheville for about a month now. In truth it’s been a bit of an adjustment for me being here, navigating new space and relationships. Drifting again in uncertainty while life rearranges itself around me. I am currently sharing a house with two lovely travellers, a youngish couple, themselves making their way via helpx. They are here for the short-term caring for the home and dogs of the owners while they are away. And me, well, while I am living here, I am doing an exchange with the homeowner’s daughter and family who live not far down the street. If you don’t know, helpx.net is an international network that connects hosts willing to offer room and/or board in exchange for some needed work with travellers looking for a creative and affordable way to travel. Helpx has been an important link for me on this mega-journey. It offered a way to stay longer in Europe opening doors to working and living in France. It afforded me a way to connect with and see a bit more of Germany when I was watching every dime that I spent. And it was a bridge when I needed to come back to the United States for just a few months to apply for and get my visa to teach English in South Korea. And now, here I am in Asheville! My helpx trade here is a pretty simple one. If you read my blog, you know by now that I pay special attention to my diet, something that doesn’t work in all households. So, for this trade I am doing a modest amount of work in exchange for my place to stay and handling my food and meal needs on my own. It’s a start and a great way to land and get to know Asheville. Wow, I truly love this. 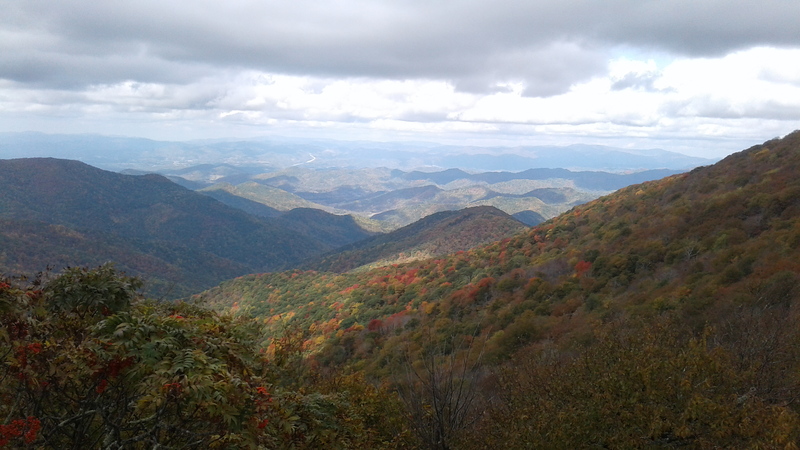 The Blue Ridge Parkway is literally just up the road from where I am staying. 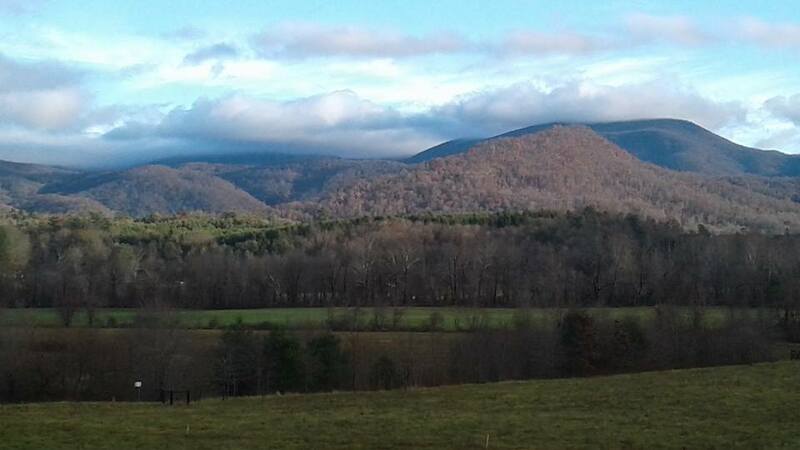 A few weeks ago I took a longer drive up the Parkway and was bombarded turn after turn with breathtaking scenery. I couldn’t take the smile off my face. As the Parkway noodles through town, it’s a road I can hop on to go almost any ol’ place… Just yesterday I was heading to a meeting about ten miles from here and lucky me, four miles of my journey was spent on the Parkway. A remarkable diversion in the ins and outs of everyday life. My current residence is part breathtakingly rural part small town/suburb. Meet some of my new neighbors! 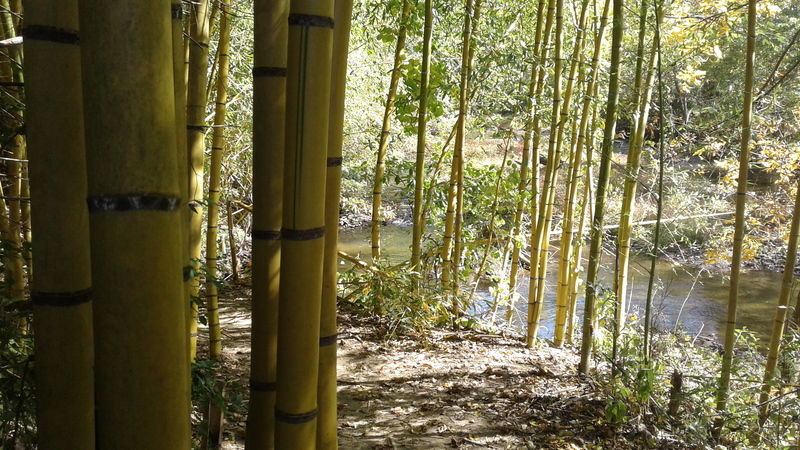 Just on the outskirts of Asheville, it takes only ten minutes to get to town with access to healthy stores, eclectic restaurants and shopping. While Asheville is the heart of much of the attraction and activity here, it is surrounded by an assortment of little towns and communities many thriving in their own way. So far it seems an interesting combination of folks from new age transplant to conservative native. It’s not everyplace that you can go for a job interview and end up here. 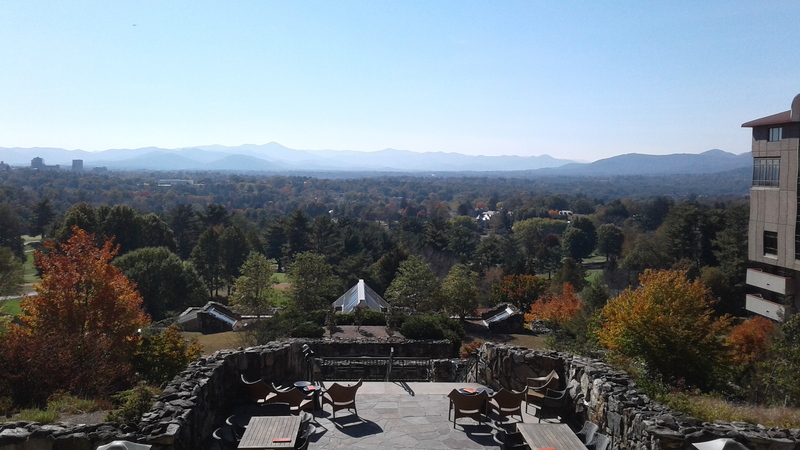 This is the view from the Grove Park Inn, one of the grandest hotels in Asheville with, as you can see, a spectacular view. It was a real treat to go there, meet and connect with folks who had worked there for decades, and also get the window seat in an elegant meeting room with a million dollar view. Little by little I am finding my way around town and slowly connecting the dots of the flavor and color that is the Asheville area. 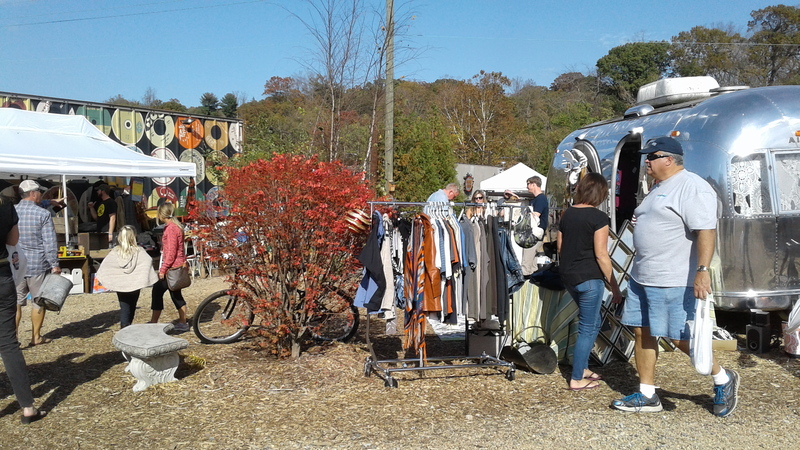 Last Sunday I stopped by the monthly flea market at Salvage Station, pictured above, filled with original crafts and flea market treasures. Much to my surprise I even ran into a “familiar face,” an unexpected treat when living in new territory. And yes I simply can’t forget YOGA! 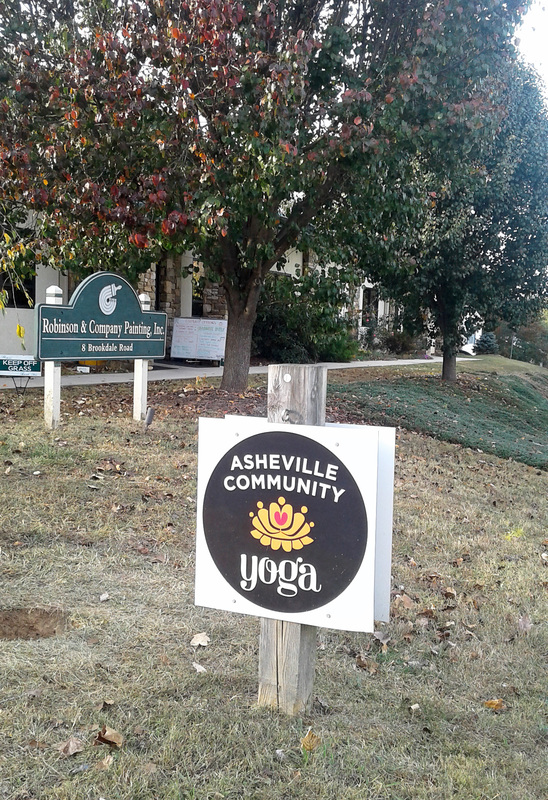 Tonight I went to a class at a studio called Asheville Community Yoga. Don’t let it’s simple unassuming appearance deceive you – the vibe and energy of the place simply blew me away. It felt like coming home to the mother ship. After many years of travel often without a yoga studio that felt like home, or access to yoga at all (other than my own personal practice) it was a relief on so many levels to enter into this warm inviting yoga space. I look forward to spending more time there. It’s been surprisingly warm here in the mountains of Asheville, with fall brimming in the trees but misleading almost summer-like temperatures. My new-to-me Honda CR-V and I are prepared for the coming winter as I am almost longing for the break that winter affords after my recent hot-hot year in Thailand. 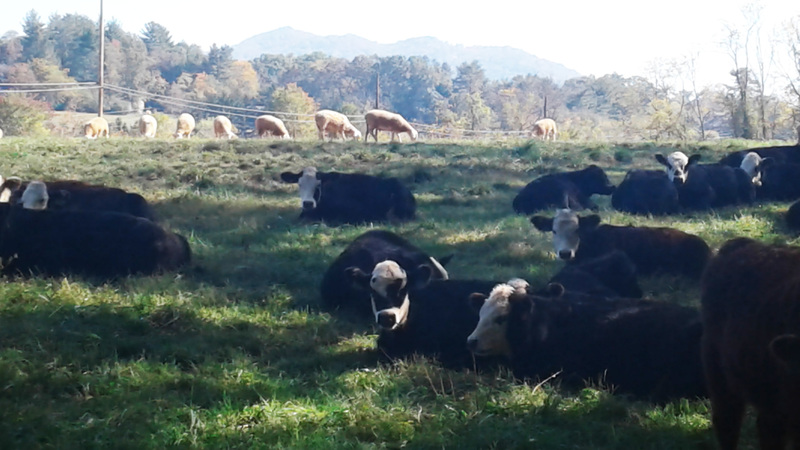 Good-bye for now as my journey and “settling in” continue in the quiet, summer-like fall in the hills of Swannanoa.